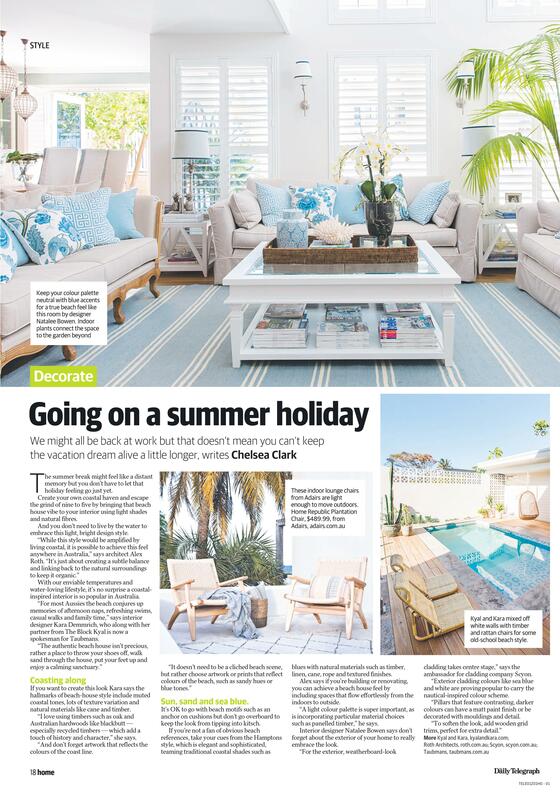 Our Watsons Bay cottage has been featured in a recent edition of the Daily Telegraph’s Home Magazine. Asked about what makes the ‘costal’ aesthetic so popular in Australian culture, we provide tips on how to capture that beach vibe all year round. We have provided below snippets of the article incase you missed grabbing a copy! We hope you enjoy. The Summer break might feel like a distant memory but you don’t have to let that holiday feeling go just yet. Create your own costal haven and escape the grind of nine to five by bringing that beach house vibe to your interior using light shades and natural fibres. And you don’t need to live by the water to embrace this light, bright design style. “While this style would be amplified by living costal, it is possible to achieve this feel anywhere in Australia” says architect Alex Roth. “Its just about creating a subtle balance and linking back to the natural surroundings to keep it organic”. With our enviable temperatures and water-loving lifestyle, its no surprise a costal- inspired interior is so popular in Australia. …. Its okay to with beach motifs such as an anchor on cushions but don’t go overboard to keep the look from getting kitsch. If you’re not a fan of obvious beach references, take your cues from the Hamptons style. Which is elegant and sophisticated, teaming traditional costal shades such as blues with natural materials such as timber, linen, cane, rope and textured finishes. Alex says if you’re building or renovating, you can achieve a beach house feel by including spaces that flow effortlessly from indoors to outdoors. “A light colour palette is super important, as is incorporating particular material choices such as panelled timber”, he says. Watsons Bay Cottage is to us, the perfect example of the beach and city life style mixed into one. We appreciate the feature in this copy of Home Magazine and look forward to providing tips and tricks to readers in the future.